As some of you probably know, the last phase in ripping the soul out of Coney Island will be completed after the the end of this summer. 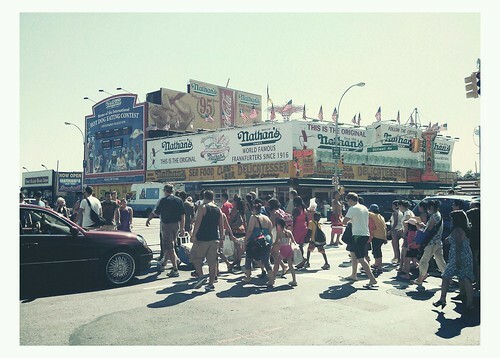 The boardwalk and most of its shops will be torn down and replaced by shiny new restaurants in hopes that young money will run out to Coney Island on summer weekends, instead of going to the Hamptons or even the Rockaways. We all know there's a fat chance of that happening. Regardless, we're approaching the last few weekends where you can catch a drink at Cha Cha's (or Ruby's!) and when I headed out there, I finally tried Denny's soft serve! Denny's Delight is off the boardwalk on Surf Ave, between the Stillwell stop and the Aquarium. They're known for doing a fantastic banana and pistachio twist, so of course that's what I got. Perfectly whipped and creamy, the nutty pistachio balances out the sweet banana, the perfect tropical ending to a beach day. If you're a lover of flavored soft serve, this is definitely on the must list. 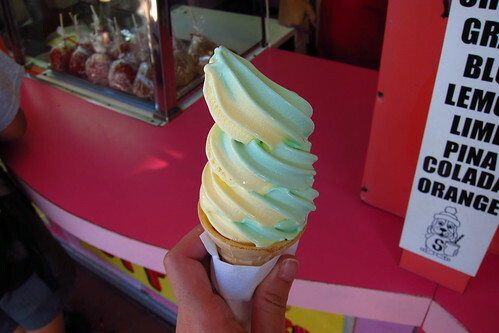 On the actual boardwalk, another ice cream/Italian ice shop has opened, Coney's Cones. I went in just after finishing my Nathan's lunch for a little refreshing ice, plus the shop's closed off so you can stand in air conditioning for a few minutes. I got a regular cup which was a tad on the pricey side at $3, but apparently everything is homemade there. My watermelon ice was smooth and flavorful, and necessary in 95° heat, but the cotton candy flavor underneath left much to be desired. 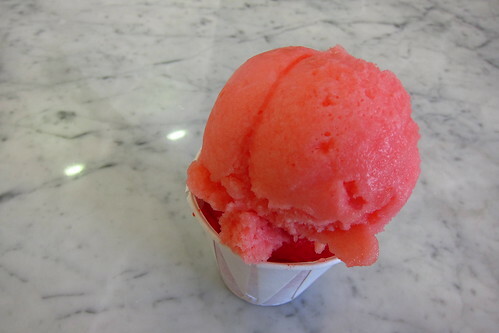 It was bright red and cloying, I wished I had gotten two scoops of watermelon since the rest ended up in the garbage after two bites. Where have I been? I didn't know they were tearing down the little food shops. Wow, that's pretty sad. Please don't tell me they're shutting down the freak show. Then I'll really cry. Hate to be the bearer of bad news, but the freak show is gone already. It's an entrance into Luna Park now.